Barcelona forward Ousmane Dembele hasn’t always won fans over in his time at the Nou Camp, but it’s clear he’s got incredible talent in there somewhere. The young Frenchman has had a better second season than first, and is currently doing bits in El Clasico this evening, with this sublime piece of skill. 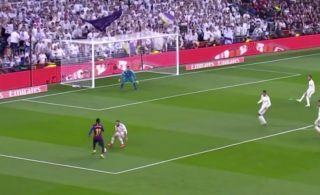 Watch the video below as Dembele takes on Real Madrid defender Dani Carvajal and twists him into knots without even touching the ball.